My son Oscar found these little gumnuts at his school and immediately I saw little faery hats. I began collecting more when I caught the attention of two young school girls who were very interested in what I was doing. 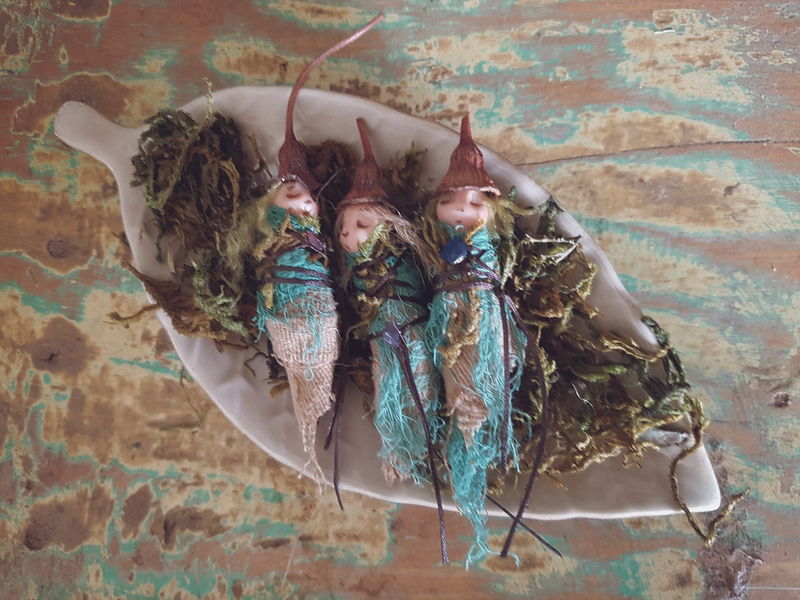 When I told them I was going to make little faeries they got so excited that they began collecting them for me too. Every time I see them they empty their pockets full of gumnuts for me, cutest thing ever! Thanks to these girls, I now have approximately 1,523,291 gumnuts. Ok, that number might be a little exaggerated.. but basically I have a LOT of gumnuts to play with. So I started the little faeries by making teeny little heads using fimo (polymer clay) and putting them on wire so I have something to work on for the body. After baking them I painted a very simple face on each one. For the bodies I wrapped the wire with masking tape to bulk it out, then covered some with florist tape as an experiment. The florist tape I had was a bit old but actually worked ok. I used some old fabric on others that I’d dyed with coffee, then added another layer of green loose fabric that I’d held onto for years knowing it would come in handy one day.. and so it did. I glued the fabric with craft glue and tied it with some twine, moss and a tiny gemstone. The hair was made using twine or wool, and finally, a little gumnut hat was glued on top. I’m not yet entirely sure what I’ll be doing with these little faeries, but I do know I’ll be gifting one to each of the girls who helped me, and I can’t wait to see their faces!